We are excited to announce the Annual Student Exhibition will open on Friday, April 12. 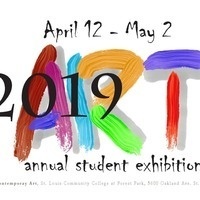 The gallery opening ceremony is from 6 to 8 pm in the STLCC - Forest Park Gallery of Contemporary Art. The exhibition includes ceramics, drawing, graphic design, painting, photography, and sculpture by our students. This is truly one of our favorite events of the year! The awards banquet will be at 7 pm in the cafeteria. Regular gallery hours are Monday through Thursday from 10 am to 2 pm or by appointment.